Other names: four-leaved rose, quadrifolium. Cartesian parametrization in a frame turned by : . The quatrefoil is the rose with four petals. It can be obtained as the trajectory of the second intersection point of a line and a circle turning around one of their points, either in the same direction and the circle going three times as fast as the line, or in opposite directions at the same speed. - the locus of the feet of the lines perpendicular at O to a segment line of length 2a the ends of which move on the axes; therefore, it is the pedal with respect to O of the astroid: (the quatrefoil thus is a beetle curve), as well as the envelope of the circles a diameter of which joins O to a point on this astroid. - the orthoptic of the astroid. or base circle with radius , rolling circle with radius , distance between the point and the rolling circle = . as the first arm completes one turn, the second one completes 3 turns. It can also be obtained as an orthopolar of a circle. Like all roses, the quadrifolium is a view from above of a clelia. This elegant spherical curve with cylindric equation is here a limit case of the seam line of a tennis ball. The quadrifolium can also be obtained by projections based on a cylindric sine wave with 2 arches (or pancake curve), through a 3D basin. Opposite, homothetic quadrifolia (in red), and their orthogonal trajectories. 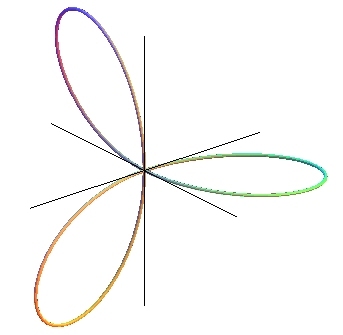 Two quadrifolia with asymptotes: , i.e. (decic), and , i.e. (octic). See also Ceva trisectrix, double egg, conical rose, and Enneper surface. 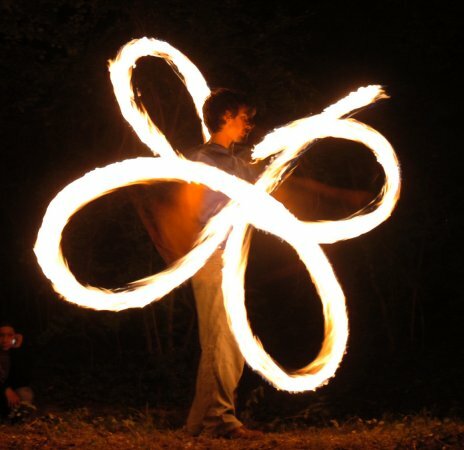 Superb quadrifolium traced by a poi player. See also the self-intersection curve of the Boy's surface.